^ 2.0 2.1 Rucker, C. B. TALLEST NATIVE TREES OF THE GREAT SMOKY MOUNTAINS NATIONAL PARK AS DETERMINED BY THE EASTERN NATIVE TREE SOCIETY. 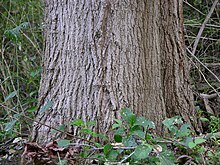 Nativetreesociety.org. [2011-05-29]. ^ 3.0 3.1 Germplasm Resources Information Network: Acer saccharum 互联网档案馆的存檔，存档日期2009-03-28. ^ 4.0 4.1 Brako, L., A.Y. Rossman & D.F. Farr. 1995. Scientific and Common Names of 7,000 Vascular Plants in the United States. ^ Hydraulic lift and its influence on the water content of the rhizosphere: an example from sugar maple, Acer saccharum. Springerlink.com. [2011-03-03].